In the endless rush to get the latest Mac that has come off the assembly line, Mac users leave behind a wondrous treasure trove of applications and documents that are of little or no use on the new Mac. The reason for this is simple – the application or document will not run using a device such as an eMac or a G5 Power Mac. The only way to appreciate this Triassic treasure trove of software is to use a Triassic Mac. These machines can vary from a 1987 vintage Mac Plus to a 1993 vintage Quadra 700 running System 6, System 7, or Mac OS 8. The most fascinating of the Triassic software are applications known as HyperCard stacks. HyperCard was the killer Mac application of the late 1980s and early 1990s. 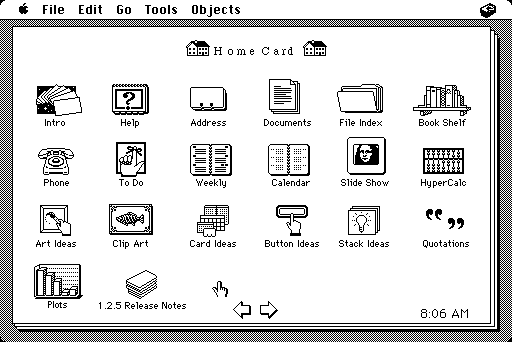 HyperCard allowed one to take text, graphics, and sound and set them up in tutorial-like arrangements with scroll bars and icons that took you to the “next page” when you were done reading and interacting with the current page. It worked much like the modern Web. Indeed, the HyperCard format most likely influenced the software engineers who were creating the first Web browsers back in the early days of the 1990s. HyperCard stacks were often created using compact Macs. This meant that the size of the “card” did not exceed the size of the 9″ 512 x 342 pixel screen of the compact Mac. The cards were also black and white. The last version of HyperCard, version 2.4, allowed for color cards along with interaction with the Web. However, color HyperCard stacks are not common. The majority of the stacks that I have seen are black and white and were most likely created on compact Macs. HyperCard was mainly a monochrome application. The heyday of card making was in the late 1980s when compact Macs were sold and used in large numbers. While the first color capable Mac, the Mac II, and its successors (including the Mac IIx, IIcx, IIci, and IIfx) started to appear on the market, the price for a color Mac was in the $6,000 to $10,000 range. For that amount of money, one could buy 3 or 4 compact Macs like the Mac SE. As a result, it was far more cost effective for a Mac user to get a compact Mac than a color Mac. Software like HyperCard was tailored to the compact Macs. HyperCard was a versatile application. It had a built-in painting program that allowed one to create images. One could also create images in other applications such as MacPaint and import them into HyperCard. One could even import and install sounds that activated when an icon on the card was selected. Icons were also used to move from one card to another. HyperCard 1.x was given away as a standard item with the purchase of a new Mac Plus, SE, or II. This was the key to HyperCard’s early success. HyperCard 2.x had to be purchased separately. However, Apple made and gave out HyperCard Player, a freeware application that allowed one to run HyperCard stacks. The final version of HyperCard was released in 1995. By then, Web pages and their accompanying browsers allowed one to run HyperCard-style files in color on different computer platforms. HyperCard was strictly a Mac program. The advent of the PowerPC chip and the lack of interest by Apple to rewrite HyperCard as PPC native software added to the application’s demise. Its image as a monochrome application also compounded its lack of popularity. In terms of the types of HyperCard stacks that were made, just about every subject of human endeavor was topic for a HyperCard stack. In old archives, one can find stacks on politics, the environment, tutorials for other software, all of the sciences, math, education, technology, all of the social sciences, the arts, and even arcade games. Stacks were also used to store clip art and lists of statistical information. While some of the information may be dated, much of it is still current and very interesting to see. In terms of finding archived HyperCard stacks, there are three places to look. The first one is a Mac Archive like the University of Michigan’s. The second is on any Mac User’s Group archive. The third is on CD-ROM collections, such as Software Vault from Digital Impact or Gigarom from Quantum Leap. Both of these CD-ROMs are probably out of print, so a scan of eBay would be helpful. I got my copy of Gigarom from eBay. HyperCard was a trend setting application. It is worth the effort of keeping a Triassic Mac running for the purposes of viewing and perhaps even creating HyperCard stacks.